Alistair Clacherty looked out for the bluespotted ribbontail ray, Taeniura lymma, when he was on sabbatical in Zanzibar in the latter half of last year. 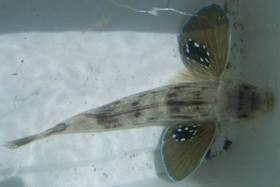 In our Coastal Fishes of southern Africa book we mention that this ray may be a complex of 2 or 3 similar species. The holotype of the species was described from the Red Sea and the Red Sea specimens all have a blue line on either side of the tail. Specimens from southern Africa lack blue stripes on the tail. This colour difference might be due to sexual dimorphism or else they may be different species . Alistair sent a photo of a blue-spotted ribbontail ray taken earlier last year off Jambiani, SE coast of Zanzibar, with no blue stripes on the tail. 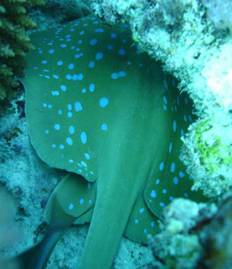 The bluespotted ribbontail ray without blue tail stripes sent in by Alistair Clacherty from Zanzibar . commercially important. The free rays at the bottom of their large pectoral fins are used to find prey and also help the fish as it 'walks on the bottom'. 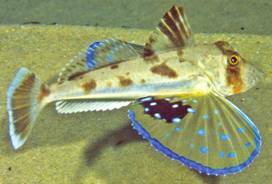 The bluefin gurnard, Chelidonichthys kumu. The photograph on the left was taken at Strandfontein, False Bay, by Reggie Lawrence. The photograph on the right is by Rudie Kuiter of a fish from southeastern Australia and can be seen in the World Atlas of Marine Fishes by Kuiter and Debelius, published by IKAN in 2006. We also targeted species of fusiliers in 2006 - they have to be shot which is not the easiest thing to do as shoals are skittish and easily startled. Among the species collected were the three stripe fusilier, Pterocaesio trilineata and the twinstripe fusilier, Pterocaesio marri, at Sodwana Bay. These 2 species were first photographed at Sodwana by Dennis Polack and sent to us in 2005.